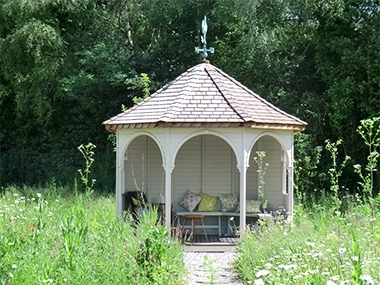 Handmade in Cedar, Chelsea Summerhouses are idyllic hideaways to relax, dine, work or play. 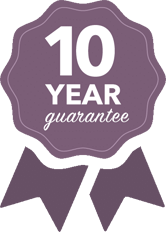 Our beautiful designs, the exceptional quality of our materials, expert craftsmanship combined with first class customer service means that all you have to do is… sit back and enjoy! 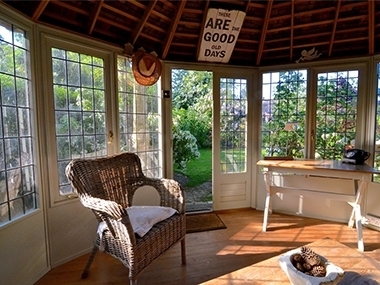 Summerhouses are the perfect way to enjoy the outdoors whatever the season, be it a country garden or an urban retreat. Our luxury range encompasses to sizes suit every garden and can be adapted for a variety of purposes including a tranquil home office, inspirational studio, gym or merely a garden retreat. Please call 0800 3317742 with any questions you may have. Our traditional design luxury Summerhouses are hand built in The UK from the finest Western Red Cedar (known for it’s durability and resistance to the elements). All summerhouses are built to exacting standards from the finest materials and are expertly finished with a long lasting cedar shingle roof. All are available in Natural Cedar or painted in any Farrow & Ball or RAL colour to suit your garden setting. Chelsea Summerhouses are the archetypal traditional garden retreat, with designs dating back over 100 years. Traditional real leaded glass is offered on all our summerhouses, double glazing upgrades are also available in plain glass. Our luxury summerhouses can be insulated offering dual use as a garden office, an artist’s studio or a garden gym for all year round use. Choose from the six sided Windsor Summerhouse, the ideal size for the smaller garden. The elegant, octagonal shaped Wraysbury available in either 8 or 10 sided models. The Kingston, a corner summerhouse, with diagonally placed doors for panoramic views of your garden. The classic, Richmond which would look good in either a town or country setting. The Abingdon an elegantly shaped oval summerhouse in 2 sizes; or the imposing Henley, rectangular in design offering substantial living space all year round. 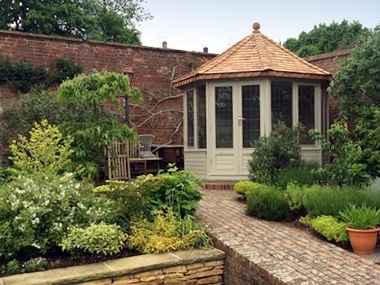 Whatever your choice, a Chelsea Summerhouse will be a great investment for generations to come.